When it comes to winter vehicle prep, your battery should be front and centre. While it may seem like a small part of your engine, it is actually responsible for getting the entire thing moving via the ignition system. A reliable charge and flow of electricity is all that is needed for a roaring start-up– but this is often easier said than done when parking outdoors during an Alberta winter. Never fear, Park Muffler is here! 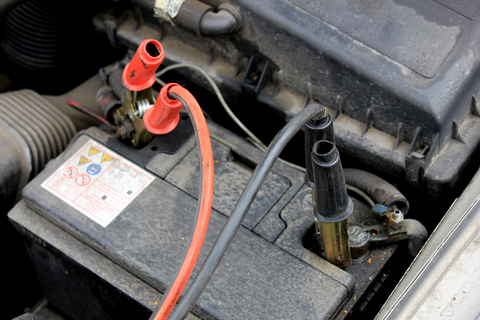 Read on for our top 5 tips to keep your vehicle battery charged in cold weather. When you “plug in” your vehicle, these ingenious innovations keep the essential areas of your engine warm and ready to go. While most vehicles sold in Alberta come standard with a block heater, it is always a good idea to check if yours has all the necessary parts. A dangling extension cord doesn’t always mean a working heater! Have the experts at Park Muffler inspect your battery or block heater before the cold hits. Another common suggestion, but still extremely important! Regular inspection of your battery’s age, condition, wiring, connections and even voltage can help you anticipate possible electrical issues. Park Muffler mechanics often advise battery replacement between five and ten years, depending on how often you service and clean the hardware. Also, try not to ever run the battery dead– this can permanently reduce its effectiveness. Heaters, audio systems, defrosters, headlights and anything that needs power to run can be extremely hard on a battery during the winter. To relieve this pressure, switch off all accessories before leaving your car. When you start it next, your battery can dedicate its full power to starting the car. Give it a minute or two and then use your electrical accessories and features as normal. A minor inconvenience for you means a big boost for your battery! Finding a safe, warm place for your vehicle to avoid the winter weather is the most effective way to extend the life of your battery. Garages (heated or otherwise), carports and other enclosures are all very helpful in keeping your vehicle a few degrees warmer. If you can’t manage that, try to find a spot sheltered from the wind with overhead protection– a natural overhang or even a large tree can make a big difference. Become familiar with jumper cables, how to attach them and how to safely “boost” or “jumpstart” your vehicle. Keep emergency numbers close at hand for tow trucks as well as a trusted friend or neighbour with a reliable vehicle. Most importantly: always keep jumper cables in your vehicle! These steps can save you valuable time and effort in extreme weather situations. The above tips are only a summary of the ways you can preserve your battery throughout the winter. Contact or visit Park Muffler today and consult with pros! We are standing by to help get you and your vehicle through the next winter safely and comfortably.